Operating a nonprofit is a great way to help others. Unfortunately, it is difficult to help when you do not have the available funds. At CMP, we understand the importance of tax-exempt status for nonprofits. Receiving a tax exemption can keep nonprofits from having to pay over a quarter of their earnings to the federal government. The reason for this is simple. A nonprofit organization is recognized on a state level. Receiving nonprofit status can give an organization special benefits related to state sales tax, property taxes, and income tax exemptions. But this doesn’t apply to federal income tax. 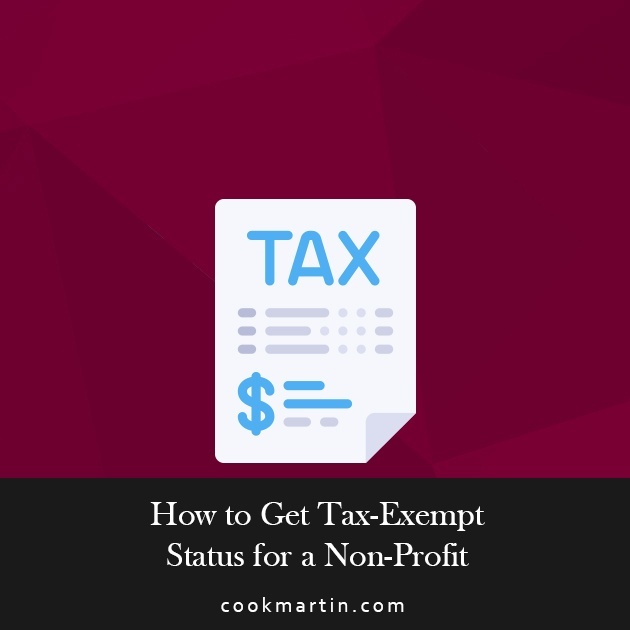 A nonprofit does not automatically receive tax-exempt status. So how do you get tax-exempt status for a nonprofit? The process is a little complicated, but we’ll walk you through the steps. Keep reading to learn how to get tax-exempt status and discover the benefits of proper filing. First, it’s important to understand the need for tax-exempt status. What does this mean for your organization? As mentioned previously, a nonprofit is created according to state law. As far as the federal government is concerned, your organization is no different from any other business, unless you let them know. Even though most tax-exempt organizations are nonprofits, your nonprofit status doesn’t automatically result in tax exemptions for federal income tax. Note that this only applies to organizations, corporations, unincorporated associations, and trusts; a partnership is not qualified to file for tax-exempt status. When creating one of these organizations, the parties involved will typically file Articles of Incorporation with the state, but the tax-exempt status is entirely separate from this filing. In order to get this tax-exempt status, you must file the necessary paperwork. Tax-exempt status allows a nonprofit organization to not pay income tax on income that is generated from activities related to the original purpose or mission of the organization. You may have heard the term 501(c)(3) organization. This does not necessarily refer to a nonprofit organization. It is actually a tax classification for tax-exempt organizations. Before your organization can be recognized as tax-exempt, you must complete the application for recognition of exemption. This is IRS Form 1023. As with most IRS tax documents, there are two versions of this form. There is the standard Form 1023 and the Form 1023-EZ. The IRS estimates that it takes over 105 hours for a novice to complete the standard Form 1023. For this reason alone, we recommend that you consider working with tax professionals. You must first consider the activity that your organization will pursue. This can include a variety of categories, including scientific, religious, and charitable organizations. You will then form a corporation following all state and local requirements. Remember, the nonprofit is a state concept. You should form your corporation according to state regulations, and this includes filing articles of incorporation. These organizing documents will be needed when you file for tax-exempt status. After you have completed those steps, you can file Form 1023 with the IRS for the tax exemption. Even after you’ve obtained your tax-exempt status, you must continue to pursue activities related to your original purpose. This is necessary for maintaining your status, and you must operate in the same manner stated in your application. Each year, when you file taxes, you must use Form 990 or Form 990-EZ. In these forms, you will include details related to your organization’s activities, revenue, expenses, and net assets. As long as you continue to operate in a manner that meets the requirements for tax-exempt status, you should not have any problems maintaining your status. Under section 501(c)(3) of the Internal Revenue Code, there are certain requirements to be considered tax-exempt. First, the organization must be organized exclusively for exempt purposes. None of your earnings can be inured to a private shareholder or individual. Additionally, your organization cannot be involved in influencing legislation or conduct activities that are for or against political candidates. Generally, organizations included in 501(c)(3) of the Internal Revenue Code are referred to as charitable organizations. These organizations can continue to receive tax deductible contributions. Basically, the organization must not be organized for the purpose of benefiting private interests. The organizing documents that you provide must explain the purposes of your organization. In addition, they must outline the activities that you will use to achieve your purposes. Also, your assets must be permanently dedicated to an exempt purpose. This means that if your organization dissolves, the assets must also be distributed for an exempt purpose. If you do not have an organizing document, then you will not be able to qualify for exempt status. Also, if the name of your organization has been legally changed since the creation of your original organizing documents, then you will need to attach an exact copy of that amendment to the application. The organizing documents for your entity are generally determined based on state law. This means that you will need to consider the nonprofit requirements for your state. How Long Will it Take to Process the Application for Exemption? The amount of time that it will take to get your application approved will vary. The IRS will try to get your application completed as quickly as possible, but the process can be delayed for various reasons. This includes errors in the application. Remember, the Form 1023 is incredibly complicated and can take over 100 hours for a novice to complete. Errors are very common if not completed by a professional tax firm. Including the wrong user fee can delay the application process and is the most common reason for a delayed approval. This fee will vary and depends on a variety of factors. In order to determine the user fee for your tax-exempt filing, you’ll need to consult the IRS fee schedule. Typically, the applications for tax-exempt status are processed in the order that they are received, but there are ways to have the process expedited. In order for this expedited processing to be granted, you must provide a compelling reason. For example, if you have a pending grant that could impact your ability to continue operating your organization and depends on your tax-exempt status, you may be able to get the process expedited. If you have a newly created organization that was created to provide disaster relief to victims of emergencies, your application could get expedited. But these expedited applications are not very common. In the end, the best way to speed up the application is to make sure that it is accurately filled out. There is a checklist on the last page of Form 1023. Make sure that you double and triple-check this checklist to avoid any errors that result in delays. Along with the details already covered, there are a few other details about filing for tax-exempt status that we’d like to share with you. If the purpose of your organizing documents for your organization change after you have submitted your application, you will need to report the changes to the IRS. A written explanation of these changes will need to be submitted to the office that is processing your application. Because these changes could impact your ability to receive tax-exempt status, these changes must be brought to the attention of the IRS as soon as possible. You should also realize that the final outcome of your application will be subject to public disclosure. Whether your application is approved or denied, the exempt status will be made available to the public. Also, before you file the Form 1023, your organization must have an Employer Identification Number (EIN). If your organization does not already have an EIN, you can obtain one by contacting the IRS over the telephone or through the mail. You can also send a fax or apply online. Obtaining tax-exempt status for a nonprofit is fairly straightforward, but there are a lot of details and paperwork involved. Due to the number of documents that you’re required to provide and the length of Form 1023, it is easy to overlook items. And if there are mistakes on your application, it will delay the approval process. At CMP, we have experience helping many organizations receive their tax-exempt status. We will ensure that your IRS Form 1023 is properly filled out and filed. If you do not want to spend over 100 hours completing a tax form, then contact us to learn more about our income tax services. If you have any questions related to tax exemptions, please feel free to leave a comment in the comment section below.